How To Coupon: What Is A Price Book And Why Do I Need One? 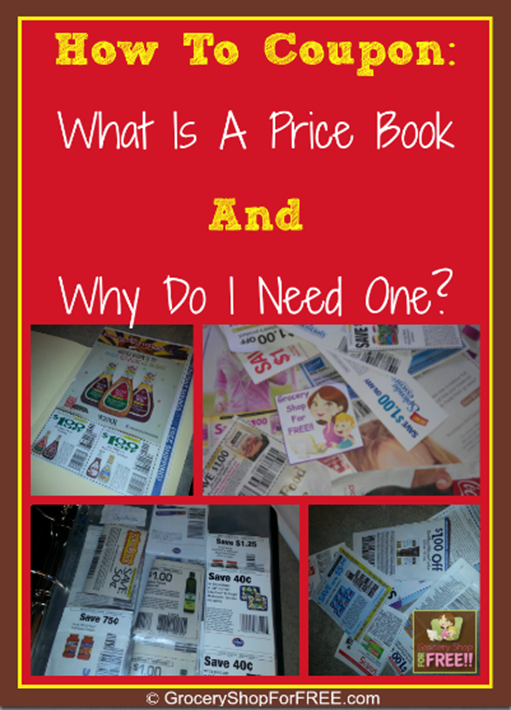 You are here: Home / Finance / Couponing / How To Coupon: What Is A Price Book And Why Do I Need One? How To Coupon: What Is A Price Book And Why Do I Need One? This is another post in our How To Coupon series. Some people think this isn’t a very important part of couponing, but trust me, it can make things go much easier and smoothly. One thing you will be thankful for as time goes on are the little things that make it easier. I do hear people tell me all the time that couponing is too hard or takes too much time. In the beginning that can be true, if you are disorganized that can be true, and if you don’t know how to set yourself up for success that can definitely be true. We have done all of these posts on How To Coupon, we have done FREE videos teaching you, we have Facebook group just for people learning, we have FREE online classes available (on Youtube, Google +, and Facebook so whatever you have access to we have made it available to you), all to make it easier for you! So, take advantage of these things and don’t let yourself get overwhelmed, we have done this to help you get to the fun part of saving more quickly! 10 Places To Find Coupons! 5 Ways To Organize Coupons! So, you have gathered your coupons, organized them, and you understand your store’s coupon policy, now it’s time to put it all to work for you! Let’s answer the questions: What Is A Price Book And Why Do I Need One? The basic premise behind couponing is easy. Wait for a product to hit the rock bottom price and then find a coupon to match, buy enough to get you to the next time it happens and do it again. How do you find out when a product is at it’s rock bottom price? You need to KNOW the prices of the products you normally buy, and their “sales cycle”. See, all products have a sale cycle. The prices fluctuate over a 6-12 week span. At one point during that time you’ll find each product’s lowest price. So, you need to start by keeping a price log/book. It doesn’t have to be anything fancy. You can use a notepad or spiral notebook, use whatever works for you. You want to keep a log for about 6-12 weeks (or longer, if necessary) of the prices of the products you normally buy. So, each week just write down the product name, the size and the price. Once you do this, you’ll then know when those products get to their rock bottom price and you’ll never overpay for them again! Once you know that price and you have a coupon for that product, you’ll know when to use it. Sometimes the products get to that rock bottom price on that last week that the coupon is valid. If you didn’t know the rock bottom you might use that coupon too soon. Again, the goal is to buy the products you normally purchase at their rock bottom price with a coupon, and buy enough to last until that happens again. Once you have kept your price book, you’ll know about how long it will be before it goes on sale again and how much you should buy to last until then! You’ll find FREE printable price book sheets to use in a notebook here along with a video tutorial I did a few years ago. Now that we have answered the questions: What Is A Price Book And Why Do I Need One? You’re another step closer to learning How To Coupon! plea email how to get learn couponing n everything. I’m learn myself n I have 3 children my budget tight every month.